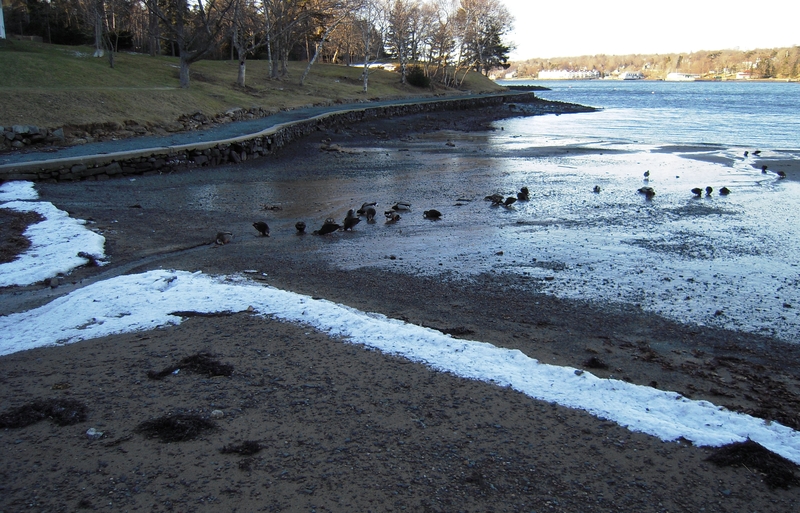 Saturday, after slipping along Frog Pond Trail, we walked along the shore and watched the ducks feeding. They were ranged along (and in) a trickle of water from the woods/hill as it washed down the beach. The ducks actually seemed to be eating the sand and mud. I wonder what they were really finding – water or maybe some small invertebrate not yet frozen? There were mallards and black ducks (or hybrids?) mixed together in this group and even a crow wandered by. Information on Mallards and Black Ducks can be found in the excellent Birds of Nova Scotia by Robie Tufts published by the NS Museum on its web site. Other really good information is available from the relaunched Hinterland Who’s Who series (anyone of a certain age will remember tv ads). And I couldn’t resist putting up a page from the Cornell Lab of Ornithology, which has such excellent material. We meandered along the shore at Sir Sandford Flemming Park in Halifax, NS. This entry was posted in hikes and walks - easy, shoreline and tagged birds, books by awalker2. Bookmark the permalink.